This sample 10-day (9 nights) itinerary covers Tallinn, Riga and Vilnius, the capitals of Estonia, Latvia and Lithuania respectively. Our top tour of the Baltic States, this relaxed pace Baltics itinerary will show you one of the most exciting up-and-coming regions for tourism in Europe. All three republics were part of the USSR and since gaining independence have all blossomed, revelling in their new found freedom. There's a pristine beauty to the landscape here, and the cities still feel relatively undiscovered. Anyone who enjoys beautiful architecture, delicious cuisine and vibrant cities will find something to enjoy. The services we provide as part of our comprehensive packages include accommodations, transfers, transport by luxury bus services and city tours. In addition to the suggested tours included we can arrange a number of excursions based on your own interests. There is also an option to travel between cities by private car or van transfers at an extra cost. Our Destination Manager in the region will provide assistance before and during your travels. They will be available to you leading up to the trip to answer any questions and arrange local services. You will be provided with information on the best these destinations have to offer, including things to see and do, restaurants, entertainment and other insider tips. Upon arrival we will provide you with a local cell phone that you can use to contact our Destination Manager throughout your trip. In all of our destinations we offer a variety of accommodation options, including boutique-style hotels, charming B&Bs and spacious apartments ranging from a three to five-star level. From our first-hand experience we can ensure they are all clean, comfortable and centrally located. We generally discourage chain hotels but provide accommodations with unique features or an authentic feel. When you arrive, we'll have a driver waiting to greet you and take you to your accommodation in the photogenic medieval Old Town of Tallinn, the Estonian capital. Today you’ll be exploring the wonders of Tallinn with a local guide who knows all the city’s secrets. You’ll be picked up from your accommodation to walk through the center of Tallinn, where the most unique historical sites are housed. From Old Town cobblestones to stunning views, you’ll get a vivid encapsulation of all the city has to offer, along with the unique insight of a knowledgeable local. There’s no better way to get your bearings and learn about the city at the same time. At the end of the tour the guide can bring you back to your accommodation, suggest a restaurant for lunch, or point you toward more Tallinn adventures. In the cool Kalamaja neighborhood, you’ll find Seaplane Harbour, the Estonian Maritime Museum, one of the local museums we recommend most highly. Inside historical seaplane hangers you’ll learn all about Estonia’s rich historical relationship with the water. On the pier you’ll see a 100-year-old icebreaking ship, restored to its impressive original state. In the summer months you can enjoy a meal at the onboard restaurant. From the museum you’ll have a lovely view of the Port of Tallinn, and we also recommend stopping in the outdoor terrace at cafe Maru. The vibrant capital Riga is next on your itinerary. We'll pick you up at your accommodation and take you to the bus station, where we'll have booked tickets and seat reservations for you. It's a 4.5 hour journey, and the buses are modern and luxurious, with wireless internet, free refreshments and more. If you'd prefer a little more comfortable and flexibility, we can arrange a private transfer for an additional fee. It includes door-to-door service and the possibility to do some sight seeing along the way. University town Tartu, the coastal resort of Parnu in Estonia or the castles and outdoor activity area of Sigulda, Latvia are all en route. A visit to Tallinn is like a trip back in time to the oldest capital city in Northern Europe. The cobblestone streets, UNESCO-listed medieval walls, and stunning church spires give it a Old World charm you’ll love exploring. But there are all the modern amenities here too, and today Tallinn is a truly unique destination with the best of the old and the new. You’ll also see influences of both the east and west in the architecture and cuisine, as Estonia is just two hours by ferry from Helsinki. The restaurants, quaint cafes and chic boutiques are places you’ll love to linger. And don’t forget about the beach if it’s a hot day! There are so many different ways to see the city, because Tallinn is so rich in history. See how beer influenced local history, or explore the reminders of life under the Soviet regime. Take a walking tour of the beautiful Old Town, or a driving tour to see more of the city. There are distinct neighborhoods here and each one feels distinct. Tallinn is very tech-savvy, so the business district is always modern and bustling. The bohemian Kalamaja neighborhood is a great place to have a drink or a bite to eat. The picturesque Lahemaa National Park is one of the best day trips from Tallinn, and you’ll have fun wandering through nature here before returning to the city to find more of its charms. When you arrive at the bus station, we'll have a driver waiting to greet you and take you to your accommodation in the Old Town center of Riga. Today you’ll be exploring the beautiful city of Riga and its UNESCO-listed Old Town. Historically an important trading port on the Baltic Sea, Riga had a strategic advantage for invaders, which resulted in periods of Polish, German, Swedish and Soviet rule all leaving their mark. You’ll walk through the winding streets of the Old Town to take in the sublime architecture as your guide makes the past come alive for you with stories. Your guide will meet you at your accommodation for this three-hour tour, and will bring you back at the, or suggest places for further exploration. 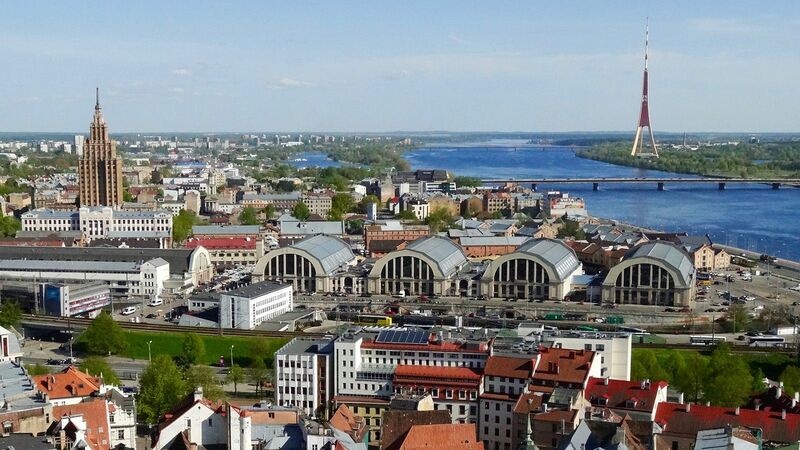 Riga’s Central Market is certainly unique, housed in old zeppelin hangars, which provide shelter and a quaint historic atmosphere. Today we recommend exploring the market with a guide, who will introduce you to some of the locals selling fresh fruits, vegetables, meats and more at the market, and provide some tastings along the way. Your guide and interpreter will also give you a few tips on haggling! One of the day trips from Riga we recommend most highly is this fascinating five-hour excursion to nearby Sigulda, where you’ll get in touch with the region’s medieval history. Your guide will meet you at your accommodation and drive you to Sigulda, where you’ll see the medieval castle of Turaida and the Turaida museum reserve, which is the country’s largest museum complex. You’ll also enjoy a visit to one of the oldest churches in Latvia and all the while have gorgeous views as you drive through the beautiful hilly Latvian countryside. The breathtaking cable car ride across the Gauja River valley is worth the drive by itself. A private driver will pick you up today for your trip to the intriguing Lithuanian capital of Vilnius. Along the way there will be a couple of stops to break up the drive. First, you'll explore the impressive and yes, decadent Rundale Palace, in Latvia. After entering Lithuania, you'll make a shorter stop at the UNESCO site known as the Hill of Crosses. Your driver will take you to your Vilnius accommodation at the end of the journey. The story of Riga is a story of resurrection. After being damaged by fighting in World War II, the city has returned to beautiful prominence after two decades of independence. Riga really has come a long way, earning UNESCO World Heritage status and being named the European Capital of Culture for 2014. This is a lovely city that takes art and culture seriously, with a packed classical music calendar and events held nightly. You’ll find plenty to enjoy in this Baltic capital. Exploring the city, you’ll have the largest market and bazaar in Europe on-hand, as well as the largest collection of Art Nouveau architecture in the world. You could spend days wandering around admiring these beautiful buildings. But there’s more to do. The city is rich in museums, galleries and concert halls, so your cultural calendar will be full during your stay. And the nightlife is excellent too, with fine restaurants, boutique bars and cute cafes. We recommend a guided tour of the city, and if you’re feeling adventurous you could climb into a kayak to see the city from its canals by night. Rundale and Sigulda are both gorgeous castles and palaces reachable for a day trip. After making a few stops, you can plan for an early evening arrival in Vilnius. Your driver will bring your directly to your accommodation in the Old Town. Today you’ll be getting in touch with the real Vilnius, with help from an expert local guide. Your guide will show you the ins and outs of the city, regaling you with stories from the past and present. You’ll learn more about Vilnius’ Jewish, Polish, Russian and Lithuanian heritage while discovering the city’s most impressive sites, including Old Town, St. Stanislovas and Vladislovas Cathedral, Vilnius University, the Presidential Palace and more. Your guide will pick you up and drop you off at your accommodation, or can suggest areas for further exploration after your tour concludes. Communism is an important part of Lithuania’s history, even if it was a dark time. If you’re interested in learning more about this aspect of Lithuania’s recent past, the Genocide Victims’ Museum or KGB Museum to the locals housed in a former KGB headquarters and prison, is the place you need to see. Today we recommend exploring it, combined with a three-hour private walking tour led by a local guide who will show you the main sites relevant to communism. You’ll get a better idea of what it was like to live under communism as the past comes alive for you. Your guide will pick you up and drop you off at your accommodation. One of our favorite day trips from Vilnius is to the historic town of Trakai, about 30 kilometers away. Should you opt for this excursion, your local guide will pick you up from your accommodation in the morning, and will drive you to the town, which is was the medieval capital of Lithuania. Here you'll find a gorgeous lake front, as well as an impressive national park and a Gothic castle. Your guide will lead you on a walking tour of the Trakai and its many attractions, then you'll have the choice of adding a boat tour of the lake for an additional fee or just crossing the bridges to the island where the castle is located. History will come alive for you here, as your guide fills you in on all the incredible events that have taken place in the castle and the surrounding region, stretching back centuries. If you like, you can also take a boat tour of the lake for an additional charge. At the end of the tour you'll be driven back to your accommodation in Vilnius. The whole trip takes about four hours. Based on your flight time, we'll have a driver meeting you at your accommodation and taking you to the airport. With one of the oldest surviving Old Town neighborhoods in Europe, as well as a collection of classic architecture from Baroque to Gothic and everything in between, Vilnius is sure to astound you. Walking around the city and marveling at the sites is a pleasure in itself, but there’s much more to do here because Vilnius is also a vibrant cultural epicenter, with concerts and art exhibitions happening regularly. There are also numerous outdoor activities and day trips to enjoy while you stay in the city. It might surprise you, but hot air balloons are a popular pastime in and around Vilnius, and the city is one of the few in Europe that allows hot air balloons to float directly over the city, so you’re guaranteed a spectacular view whether you opt for a flight over the city or nearby Trakai. There’s also a rich Jewish heritage to explore here, including the former synagogue and the larger and smaller ghetto. We’d also recommend delving into the darker areas of the city’s past and exploring the communist era and the history of the KGB in Vilnius at the KGB Museum. Don’t miss Uzupis, a bohemian neighborhood of galleries, restaurants and cafes. "This was a Grand Tour in all respects. Great hotels and guides. Flawless execution of travel between cities. We have traveled a lot and your services were the most impressive. The Baltic states were new territory for us and we appreciate the recommendations on which cities to visit beyond the standard stops. All of the hotels were exceptional. Returning to the US has been like returning to a barbarian society. All of the tour guides were exceptional and added great value to the trip." "JayWay is good to work with: if you know what you want, they will book it but if you need a lot of help, they can do that too! Kevin was great to work with. He made several good suggestions, including using drivers to take us from country to country in the Baltics. He was knowledgeable and helped make the trip a success. Moonika was very nice and kept in touch to be sure all was ok."
"Our Lithuania/Latvia trip was exceptionally planned by JayWay and we were able to visit more locations than I thought was possible. The hotel recommendations were good and the trip recommendation to Curonian Spit and Nida was exceptional. We would not have known to visit Nida if JayWay had not recommended it and it was the best day of our trip. Transportation was excellent and on-time. We especially enjoyed the relaxing bus trip from Riga to Vilnius which had excellent accommodations. We wish to thank our guides in Klaipeda, Riga and Vilnius. Their knowledge of each city and comfortable friendliness made the tours a very fun part of our trip. We appreciated the constant communication with JayWay staff before and during the trip to ensure that all accommodations were as expected." "Another amazing JayWay journey. My wife and like to enjoy our travels and Jayway with your knowledge of hotels, restaurants, sights, along with appropriate transfers take away the stresses that can so often dimish the joy of seeing new, far away places. Darja was most helpful and has a genuine sense of responsibility and was great to meet and share lunch with. Dear Jay, my wife and I will remain grateful for the wonderful experiences we had because of your efforts and those of your staff. It is hard to imagine a more proficient and concerned tour company." ''There were a lot of favorable experiences - perhaps the 50th anniversary dinner. "I am fairly independent and like to go off and walk and explore on my own. If you like this method of travel, JayWay does a good job. The staff in each hotel was very friendly and very helpful and Darja made me feel as if I were her only client. Very diligent in her efforts." Our trip involved 33 days total. Jayway arranged for all but our flights. Every aspect of our trip was well taken care of and wonderful. The guides, excursions and transfers were well arranged without exception. Every question before the trip was answered promptly and thoroughly. During the trip when a few issues arose, our contact Darja, was readily available and helpful. We had a wonderful time. "Absolutely first-rate experience. A special shout-out to our in-country liaison, Darja, who was outstanding in all ways, even calling us mid-trip to make certain that everything was well. Just a delight. Keep up the great work. Hope to travel with you again in the not-too-distant future."